Bookcase, XF239, designed by A.T. Bolton c.1920, mahogany, ebony and glass. ©Sir John Soane's Museum, London. Photograph: Hugh Kelly. 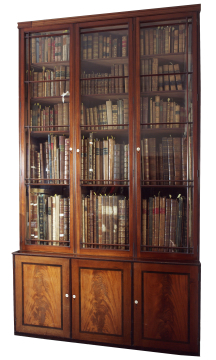 This bookcase was not part of Soane's collection. One of pair with XF238, designed by A.T. Bolton (Curator 1917 to 1945) to stand to the left of the South Drawing Room fireplace in the Architectural Library he created in the North and South Drawing Rooms in c.1920.In 2005 this Bookcase was re-located to the first floor of No. 14 to enable two floors of that building to become a new enlarged Research Library.